Neil Redfearn has parted company as manager of Northwich Victoria after just nine games in charge. Redfearn resigned following talks with chairman Mike Connett in the aftermath of Saturday's 3-1 loss against Histon. Paul Warhurst, who made his debut in that game after signing on non-contract terms, will take charge of the Vics for their game at Halifax Town on Tuesday. Former Barnsley, Oldham and Charlton midfielder Redfearn, 42, was appointed in the summer. He joined the club following the departure of Steve Burr. A number of key players also left the Victoria Stadium and with Redfearn's recruitment policy failing to pay off, the Vics are bottom of the table with just one point from their first nine games. 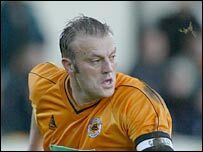 Redfearn, who had a previous spell as manager of Scarborough, last week placed five players on the transfer list and signed three more, including the 37-year-old Warhurst. But Saturday's fourth home defeat of the season proved the final straw for Redfearn's brief reign.